Olivia Colman, Emma Stone, and Rachel Weisz are a majestic triumvirate in a period piece that's as tragic as it is hilarious. A cross between a court jester and a mad king, Yorgos Lanthimos has been on his way toward reigning over world cinema since “Dogtooth” introduced new meaning to words like “sea” and “excursion.” Apropos of its subject, “The Favourite” feels like a crowning achievement: a royal period piece led by the majestic triumvirate of Olivia Colman, Emma Stone, and Rachel Weisz in which the emperor has no clothes, duck races are the go-to entertainment, and loyalty is as strange a concept as a new-world fruit called a pineapple. Colman plays Queen Anne, whose 12-year reign at the beginning of the 18th century was marked by poor health and the competing attentions of Lady Marlborough (Weisz) and the newly arrived servant Abigail (Stone). At the center of the plot is a war, never seen but often spoken of by Her Majesty’s advisors, and the question of how to fund it. It’s something of a MacGuffin, a distant concern that would be at the forefront of everyone’s mind were they not so busy playing with rabbits and endlessly plotting against one another. The skullduggery is hilarious in its absurdity, but as the stakes get higher you begin to pity all involved — this isn’t the kind of game that anyone truly wins. Lanthimos’ career trajectory up to this point has been genuinely remarkable, going from Greek Weird Wave standard-bearer with his breakout “Dogtooth” to Best Original Screenplay nominee within the span of a few short years. Crucially, this wider exposure hasn’t come at the cost of his unique sensibility: The mainstream has come to Lanthimos, not the other way around. His comedy remains pitch black, his characters still speak of grave matters in monotone, and sudden outbursts of violence are never far away. “The Killing of a Sacred Deer” was something of a lateral move after “The Lobster,” exhibiting a familiar deadpan absurdity in its dialogue even as Lanthimos and frequent collaborator Efthimis Filippou wrote themselves into a corner they never fully managed to work their way out of. Though its stunning, candlelit interiors and setting invite comparisons to “Barry Lyndon,” “The Favourite” is more akin to a film like “Jackie Brown” for the way it represents both an expansion of and slight departure from its director’s established sensibility. Notably, it’s also the first film that he didn’t have a hand in writing: Deborah Davis and Tony McNamara are responsible for the script, which feels so in keeping with Lanthimos’ style that it must have been written with him in mind or refined by the filmmaker as he brought it to screen. All three members of the main trio are at their best, but it’s Colman who most deserves a coronation. One of the most consistently excellent actresses working today, she brings depth and dimension to a character who so easily could have been an unsympathetic joke. A queen in name only who’s ceded most of her power to her trusted advisor, Anne has no real knowledge of her thrall and desires only to be placated and humored by her underlings. A kingdom cannot thrive in such conditions, of course, but it can persist so long as the hoi polloi is kept at bay and the inner workings are kept secret from those who would revolt if they knew the truth. Lanthimos isn’t considered an “actor’s director” in the same way as Quentin Tarantino and David O. Russell, but maybe he should be — his unorthodox style allows (and perhaps even forces) performers to display aspects of their repertoires that few, if any, other directors would even be interested in tapping into. Anne is far from a benevolent dictator, but Colman makes it clear that her cruelty is born of pain. “Love has limits,” the queen says early on — and Weisz responds, “it should not.” That’s their conflict distilled to its purest form, and it’s one that Abigail exploits masterfully. Stone could have done anything she wanted after her Oscar-winning role in “La La Land,” and it’s to her credit that she chose something as bold as this. Abigail is a slippery figure, one whose wily nature is on display from the outset but whom Stone makes you want to trust against your better judgement. She’s especially magnetic when playing off of Weisz, who, like Colman, worked with Lanthimos on “The Lobster”; they’re two sides of the same coin, and wouldn’t hate each other so much were they not so alike. Shifting power dynamics have long been a constant in the director’s work — consider the domineering parents in “Dogtooth” or the quest for vengeance that drives “The Killing of a Sacred Deer” — and so it was probably inevitable that he would turn his attention to royalty. 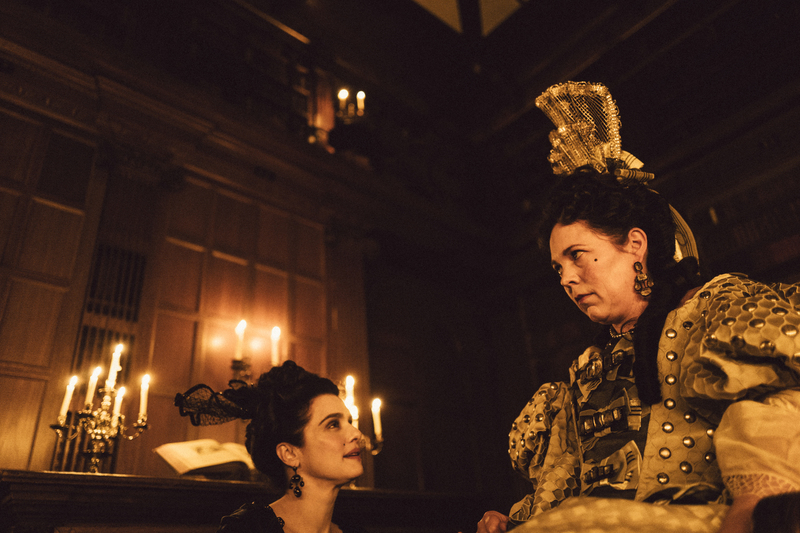 Unlike the three women’s self-interested schemes, “The Favourite” isn’t a zero-sum game. Its palace intrigue is at once seductive and repellant, and there’s a kind of catharsis in seeing it reach its natural conclusion. As is often the case with Lanthimos, there’s a deep well of sadness beneath the humorous surface. That Anne has 17 pet rabbits stops being so funny once you learn that each one represents a child she’s lost, for instance, and Abigail’s lust for a higher position seems less malicious when you consider that the most likely alternative is being thrown out onto the street and selling her body. Lanthimos wants us to examine the different reasons we grasp at power — avarice, self-preservation, even fear — and better understand its corrosive effects. “Some wounds do not close,” Anne says at a crucial moment. “I have many such.” The more ridiculous she becomes, the more tragic a figure she strikes. Ditto “The Favourite” itself. Fox Searchlight will release “The Favourite” in theaters on Friday, November 23.